Gluten free. No preservative. No artificialflavours /colours. 100% vegetarian.North Indian milk dessert mix. A traditional popular favourite North Indian sweet made by thickening milk in open pan. This can be enjoyed as it is or as accompaniment with crisp Jilebies. 1 Mix in Milk Mix the contents of the pack with 500ml lukewarm milk. Blend well. Tip : For richer taste use full cream milk 2 Boil Bring to boils stirring continuously. Simmer for 10 min. or till desired consistency. 3 Serve Chilled. Serve chilled. 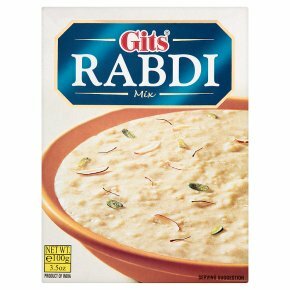 Tip : Serve delicious Rabdi with hot Gits Jilebies.